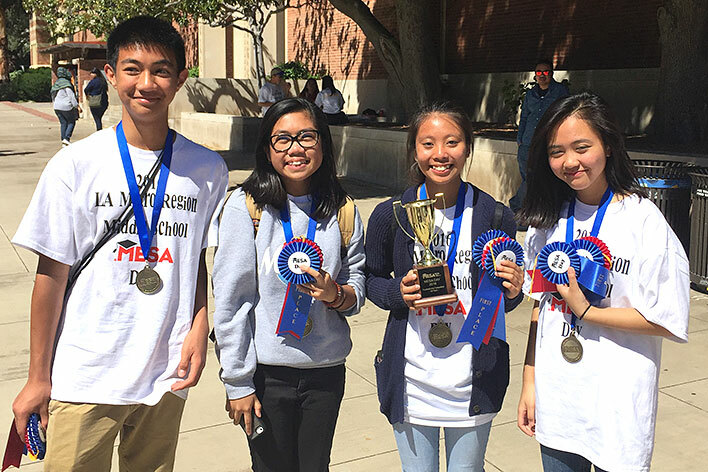 Students from local schools have earned local, regional and state honors in recent Math, Engineering, Science Achievement (MESA) competitions. Among the winners were Hudson K-8 School’s students, who earned a first place award at the Los Angeles Metro regional competition in the prosthetic arm category, advancing to state competition last weekend at UC Irvine, where the students placed third for device performance and third overall. The Hudson team consisted of Ab Tudayan, Julienne Quides, Marygrace Gliane and Giannka Picache. Their advisor is Anastasia Hubbard. Last year the team went to the nationals in Utah. Also among this year’s regional winners was Nelson Academy eighth grader Jakarta Robinson, who captured a first place medal at a UCLA competition. View a list of preliminary and regional honorees at California State University, Long Beach’s recent MESA Day contests. MESA AWARDS – Hudson K-8 School’s Math, Engineering, Science Achievement team displays awards earned in a prosthetic arm contest. Several schools earned MESA honors.